This wonderful adult Crocodile with his tail curled to the side is fantastic in African or Australian themes and looks great with the two 4ft Baby Crocodile models. 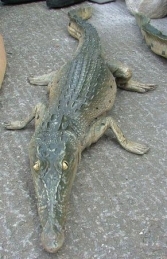 Our adult Crocodile model is superbly detailed, this replica reptile statue is ideal for jungle and tropical river scenes. 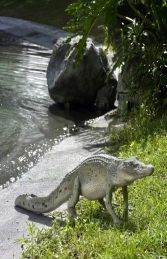 The Crocodlie could also be used in Egyptian or Pirate themed areas..or even in your garden by the pond or pool.